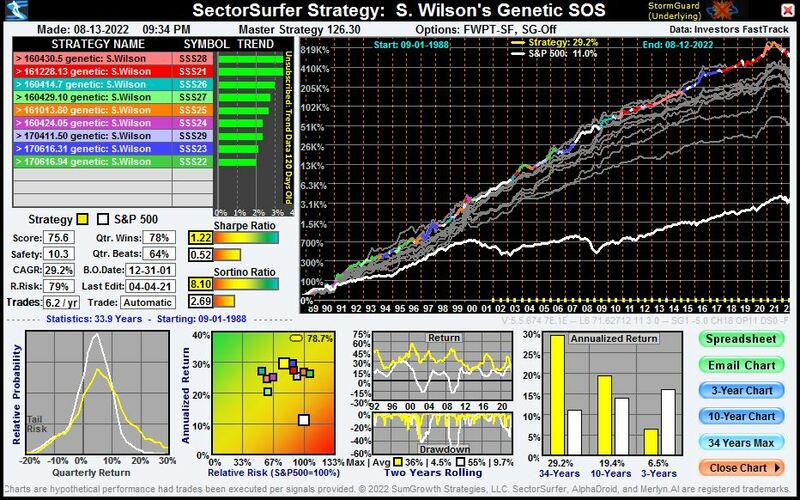 Stewart Wilson's effort to develop a genetic algorithm for selecting a set of 12 Fidelity sector funds as members of a SectorSurfer Strategy was first reported in our January 2017 Newsletter. About a year earlier, Stewart contacted us about experimentally developing a genetic algorithm to pick funds from a set much larger than the 12 funds a SectorSurfer Strategy can hold, such as the 40 Fidelity Select sector funds. The purpose of the genetic algorithm would be to automate the fund selection process and completely remove any human-induced hindsight selection bias. Even though Forward-Walk Progressive Tuning is employed, a SectorSurfer critic would be on reasonable grounds to ask "When did you pick those funds?" Answering "today," results in the critic saying "Obviously you picked those funds in hindsight knowing they would do well." While it is possible to carefully select a set of strategy funds that have no hindsight bias (by including representatives of all market sectors), a genetic algorithm simplifies the problem by inherently eliminating hindsight selection bias and the associated risk of future underperformance associated with it. Unfortunately, Stewart and I quickly found we had significant compatibility problems between SectorSurfer's Windows-based server and programming languages versus Stewart's Linux operating system and Lisp programming language (more common among academic researchers). Even simple file sharing was a problem. However, we were mutually determined to proceed and agreed that Stewart would first have to recreate SectorSurfer's fundamental momentum and differential processing algorithms by using little more than emailed descriptions. Only then could he begin to layer his genetic algorithm for evolutionary fund selection on top. 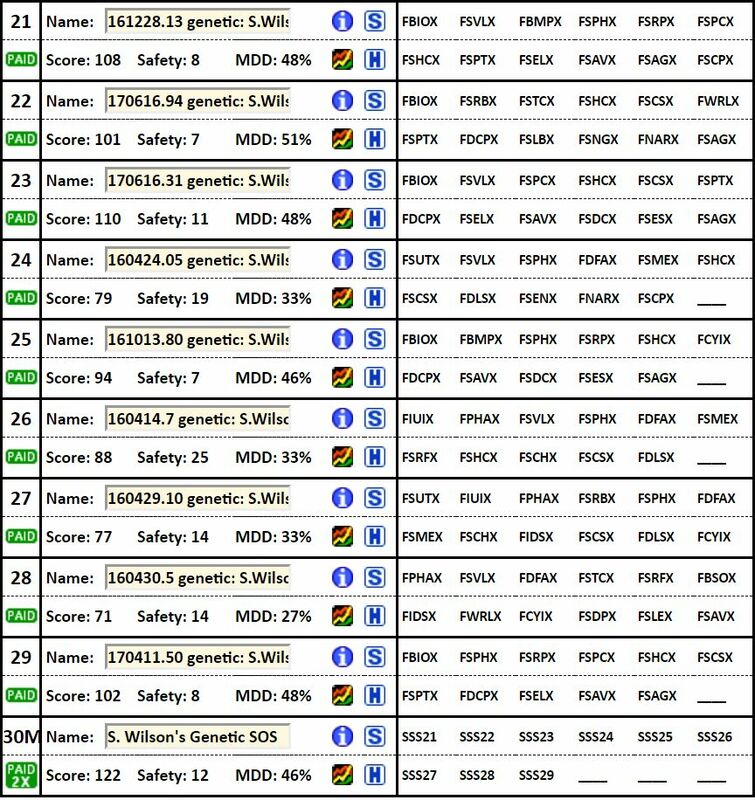 Over the course of about a year, Stewart's work eventually began to bear fruit as illustrated by individual Strategies of this portfolio, each of which was designed by his genetic algorithm and imported into SectorSurfer to confirm the performance indicated by his software. This Strategy-of-Strategies includes nine candidate Strategies that were created (funds selected) by Stewart's genetic algorithm in late 2016. Although initially created without the benefit of Forward-Walk Progressive Tuning, each of these underlying Strategies have had this feature enabled with the corresponding BornOn Date of 1-4-2010 and thus will be able to automatically adapt to future changes in market dynamics. Note: At the SOS top level, StormGuard is disabled because it was deemed to be the responsibility of each underlying Strategy. Stewart's work was both proof-of-concept and inspiration for the 2018 development of our Merlyn.AI genetic algorithm, which takes this work to the next level, where (1) strategies incrementally evolve monthly; (2) StormGuard Armor, Bear Market Strategies and Forward Walk Progressive Tuning are fully integrated; (3) portfolios of Strategies can be created and managed; (4) larger sets of ETFs and mutual funds are easily managed for sector and asset class strategies; (5) exclusion of unsuitable funds is automatic, and (6) the proper files and connections are made so that it can integrate seamlessly with our SectorSurfer and AlphaDroid platforms. We are very happy to now have Stewart onboard as our AI Science Advisor to help us get our Merlyn.AI technology right and ponder future improvements. 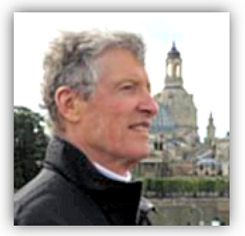 We are also happy (in hindsight) for the system compatibility problems we initially had because the independent recreation of SectorSurfer in Lisp by a professional and academic of Stewart's stature provides serious validation of SectorSurfer's underlying concepts and algorithms. A SectorSurfer Strategy selects the trend leader from among a set of candidates — and for a Strategy-of-Strategies (SOS) the candidates are a set of Strategies instead of a set of stocks or funds. Since each of the SOS underlying Strategies have already been maximized for performance, there is generally only minimal further upside performance that can be extracted. The primary benefit of an SOS is to make sure that you stick with the best performing of the candidate Strategies and steer clear of the others. For example, if the Strategy you own gets a "flat tire" for some period in the future because you just didn't quite have the perfect set of candidate sector funds, it's quite likely that one of the other candidate Strategies will still be performing well and will be automatically selected for you by the Strategy-of-Strategies. Thus, a Strategy-of-Strategies is a form of insurance designed to reduce future risk of Strategy sub-performance. Instructions for building your own Strategy-of-Strategies can be found HERE. Although implementing a typical Strategy-of-Strategies would require using 4 to 5 normal Strategies and have a corresponding subscription price of $40 to $50 per month, a Master SOS can be imported into your account for a fraction of that cost. However, a Master SOS is priced higher than a standard Premium Strategy. The X factor is specified in the left column of the Select-a-Strategy popup and of your Strategies list where "Paid 3x" indicates that it will be charged at a rate 3x that of a normal Premium Strategy. A Strategy-of-Strategies is composed of multiple candidate Strategies, of which only the trend leader among them is selected to finally determine which one fund will be owned next month. All of the Strategies are generally related in some way and are intended to have (or allow) a degree of redundancy in their construction because the job of a Strategy-of-Strategies is not to choose between a set of ideally uncorrelated assets, but rather to choose the Strategy best formulated for current market conditions as evidenced by its current performance. Each of the underlying Strategies is configured with a set of up to 12 funds, each representing a different slice of the market; sector, country, commodity, or asset class. SectorSurfer's algorithms determine which fund is designated best-of-breed based on its trend leadership. The yellow line on each chart plots the performance of the strategy, which owns only the designated best-of-breed fund at any given time. This is True Sector Rotation (or serial diversification) and is a powerful investment ally best appreciated through its performance. SectorSurfer Strategies typically produce only about four trades per year, and Forward-Walk-Progressive-Tuning, the industry gold standard for backtesting, has been incorporated. The SOS chart (top-right) plots the performance of each of the contributing strategies in grey, the S&P500's performance in white, and the Strategy-of-Strategies in the multi-colored Painted Path format where each of the colors indicates which of the Strategies was selected at that time. As previously indicated, the Strategy-of-Strategies purpose is not to extract additional great returns, but to act as a form of insurance designed to reduce the risk of sub-performance in the future should one of the Strategies get a "flat tire" for a while. Level the playing field with Wall Street by putting SectorSurfer's Secret SOS to work for you. We'll do the hard work ... while you go have a life. All Master SOS are designed and maintained by SumGrowth Strategies and are only available for importing into your My Strategies page through the Select-a-Strategy popup window. Click the icon to open the Select-a-Strategy popup window. In the top-center of the screen, you will see a series of checkboxes (as shown to the right). Click the checkbox to "Include Master Strategies," and un-check the others to clear them so only Master SOS are listed. The partial listing to the right shows the first five Master Strategies: three for ETFs, two for Fidelity funds, and one for Vanguard funds. Each of them indicates they are Premium Strategies with a 2X cost factor - meaning the subscription billing software will count them equivalent to two Premium Strategies. Under the 30-Strategy subscription, the price breaks that occur at both 5 and 15 Strategies are correspondingly honored. Under the 10-Strategy Legacy subscription, you must have 8 or fewer Strategies in your account to import a Master SOS. If you desire to import any of the underlying Strategies for further experimentation or analysis, their Strategy-IDs are listed to the right, but are otherwise not needed for Master SOS operation. to help individuals improve their retirement plan prospects by providing state-of-the-art automated algorithms for investment analysis / advice. SumGrowth Strategies,TM LLC is not a registered investment advisor and does not provide professional financial investment advice specific to your life situation. SectorSurfer is solely an algorithmic strategy analysis tool that produces trade signals according to the set of funds provided for analysis. Please Read More Here.